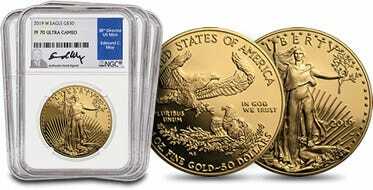 The 2017 Gold American Eagle Proof 70 Set is sure to be the release of the year from the U.S. Mint, offering great growth potential in the Investment Grade Coin market. In addition to being the 38th Director of the United States Mint, Edmund C. Moy is a well-known author, economist and public speaker. He served as Special Assistant to President George W. Bush for over five years and assisted with the transition to the new U.S. Department of Homeland Security after September 11, 2001. 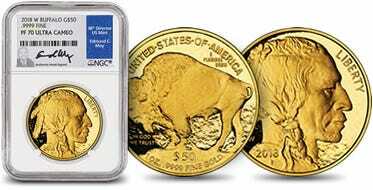 The U.S. Mint sold over a $1 billion in numismatic collectibles and struck over 16 billion coins n Moy’s first year as Director. 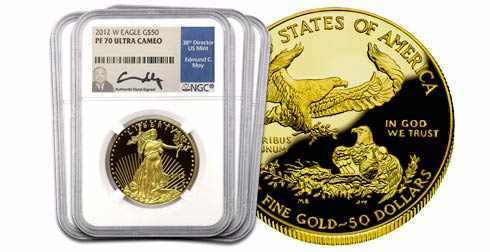 During his tenure as leader of the U.S. Mint, the financial crisis, and recession spurred an unprecedented demand for gold and silver bullion. The 50 State Quarter program, the Presidential $1 Coin, and the National Parks Quarter program were also milestones of Ed Moy’s term with the U.S. Mint.